Humayun’s Tomb is the first tomb built with several innovations, set at the centre of luxurious gardens with water channels, was the precursor monument to the Taj Mahal (built a century later). It was built in 1570 and was inscribed as a UNESCO World Heritage Monument in 1993 for its cultural importance. It was built in 1569–1570 by the second Mughul Emperor Humayun’s widow Biga Begum (Hajji Begum). 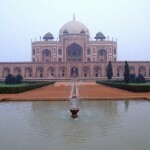 Apart from the tomb of Humayun, the funerary also has 150 tombs of various members of the royal family. The tomb set on an irregular octagonal plinth has a raised dome of 42.5 m height, covered by marble slabs and decorated with chhatris. The Sundarbans National Park, the largest estuarine mangrove forest in the world is a National Park, Tiger Reserve, UNESCO World Heritage Site and a Biosphere Reserve located in the Sundarbans Ganges River delta bordering the Bay of Bengal, in West Bengal. The Sundarbans, as a whole encompasses 10,000 km2 (3,900 sq mi) of land and water, about 5,980 km2 (2,310 sq mi) in India and the balance is in Bangladesh. It is integral to the world's largest delta of 80,000 km2 formed from sediments deposited by the three great rivers, the Ganges, the Brahmaputra and the Meghna, which confluence in the Bengal Basin. 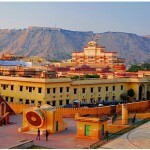 The Jantar Mantar in Jaipur is a collection of architectural astronomical instruments, built by Maharaja (King) Jai Singh II at his then new capital of Jaipur between 1727 and 1734. It is modelled after the one that he had built at the Mughal capital of Delhi. He had constructed a total of five such facilities at different locations, including the ones at Delhi and Jaipur. The Jaipur observatory is the largest and best preserved of these and has a set of some 20 main fixed instruments built in masonry. 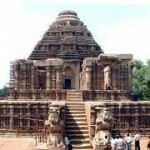 Sun Temple is a 13th-century Sun Temple (also known as the "Black Pagoda"), at Konark, in Orissa. Located on the east coast of the Bay of Bengal in the Mahanadi Delta it is built in the form of the chariot of Surya (Arka), the sun god with 24 wheels, and is heavily decorated with symbolic stone carvings and lead by a team of six horses. It was constructed from oxidizing weathered ferruginous sandstone by King Narasimhadeva I of the Eastern Ganga Dynasty. 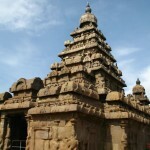 The Group of Monuments at Mahabalipuram, in Tamilnadu, about 58 km from Chennai, were built by the Pallava kings in the 7th and 8th centuries. The town is said to have gained prominence under the rule of Mamalla. These monuments have been carved out of rock along the Coromandel coast. The temple town has approximately forty monuments, including the largest open-air bas-relief in the world. It was inscribed under the UNESCO World Heritage list in 1984 as a cultural heritage under categories (i)(ii)(iii)(vi).